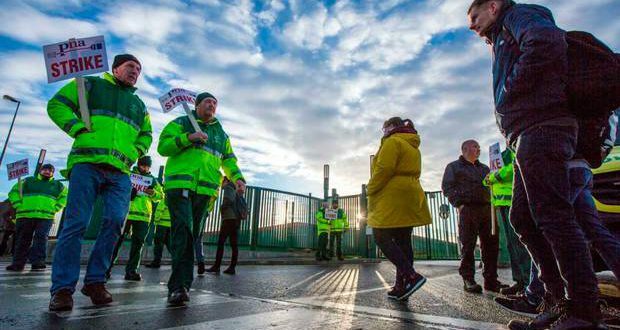 Hundreds of ambulance paramedics, advanced paramedics and emergency medical technicians placed pickets on HSE ambulance depots across the country on Tuesday, 22 January. The workers are members of the Psychiatric Nurses Association (PNA) and are locked in a battle with the HSE over the issue of union recognition. 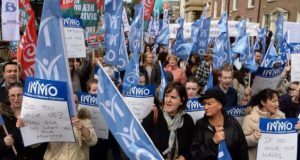 The strike came just eight days before the first Irish Nurses and Midwives Organisation (INMO) strike day on 30 January; it represents another clear signal that the patience of an underpaid and overstretched health service workforce is coming to an end. A very significant feature of the strike was the decision made by SIPTU members up and down the country not to cross pickets. This was in defiance of the HSE and a treacherous instruction from the union that they should do so. The main way in which SIPTU members avoided having to cross pickets was by ringing in sick. Another significant development was the number of army personnel who also rang in sick rather than go on standby duties while pickets were in place. A victory for the PNA ambulance staff would increase the chances of a nurses’ victory and vice versa, underlining the importance of the two struggles and solidarity with each other. According to HIQA (Health Information and Quality Authority) the HSE’s ambulance service is about 300 ambulances and 600 staff short of best international practice. The upshot of this is a severely overworked ambulance staff faced with a huge burden of stress. Ambulance workers who have refused some duties in recent months on health and safety grounds (exhaustion) have been hit by suspensions, in one case lasting 8 months. The refusal of SIPTU to fight and struggle against the reversal of austerity measures aimed at public sector workers and the overwork of ambulance staff resulted in rank and file dissatisfaction and the formation of the breakaway National Ambulance Service Representative Association (NASRA) in 2010. NASRA now operates under the banner of the PNA. Back in 2017 the HSE cancelled payroll deduction of union subs for PNA ambulance staff and set the torchlight for the 2019 strike action. The HSE’s tactics represent a clear case of an attempt at union-busting. Workers should have the right to be represented by the trade union of their choice. At the time that payroll deduction was cancelled, the PNA organised 611 ambulance staff, a large minority of the overall workforce. This is a clear-cut trade union recognition dispute. PNA members on the picket lines clearly felt that HSE refusal to climb down should be met with further action and nurses’ strikes are unlikely to be the only strike action affecting the Health Service in February. Victory for the ambulance paramedics and emergency medical technicians and victory for the nurses would represent a step towards a national health service run for need not profit. Only a properly funded national health service that is free at the point of use and under the democratic control of its workforce and the wider working class can guarantee decent wage conditions for health workers and proper healthcare for all.